After a long day of travel, five Rewilding Europe team members from Velebit (Croatia) and Eastern Carpathians (Poland) arrived at the Kuikka base camp of Wildlife Safaris Finland. Here, we would spend the next two days with experienced wildlife photographer Lassi Rautiainen, learning about his highly successful wildlife photographic and tourism business, with the aim of attaining a better understanding of the operating standards and finer details behind Finnish wildlife watching. 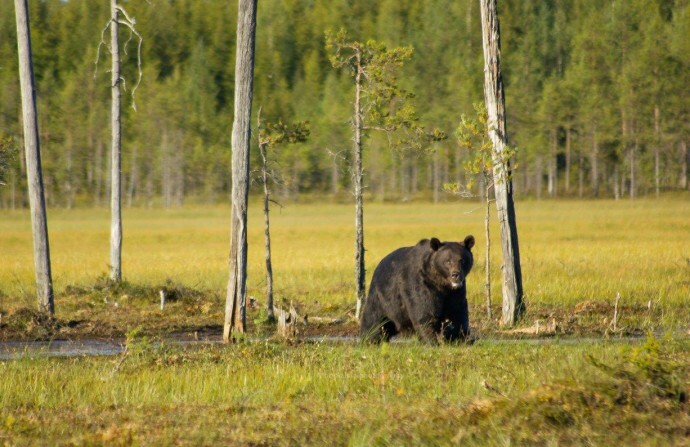 Brown bear (Ursus arctos) strolling in the open landscape of the south-eastern corner of the Kainuu region, Finland. The Kuikka base camp of Wildlife Safaris Finland , situated at the municipality of Kuhmo next to the border with Russia sits on a headland, surrounded by the Kuikka Lake and boreal forest. Following a brief introduction, we packed our gear for the evening out in a photographic hide. The hides were a short drive through the forest and the final 200 meters accessed on foot. With a combined team of both experienced and novice wildlife enthusiasts, the excitement and anticipation was palpable as we arrived at the hide, light up only by the moonlight. The minimalist design of the hide leaves all focus on the external environment, but includes comforts such as basic bunk beds, sleeping bags and simple toilet facilities. Well insulated and glazed, the hides hold warmth during the cold night, and deadens any sounds that may alert animals about our presence inside. Rewilding Europe team members inside the wildlife watching hide in Khumo, Finland. We scan the horizon in anticipation hoping to catch a glimpse of a bear or wolf. The night is long but the distant light on the horizon never quite fades and after a few hours we settle into the bunk beds for some rest with alarms set for dawn at 4am. 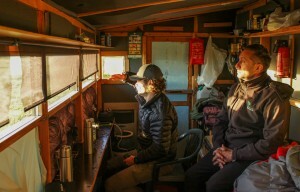 With a warm cup of coffee in one hand and a pair of binoculars in the other, the team greeted the early morning to catch a glimpse of any wildlife that might appear. Birds begun calling and soon the dawn chorus was in full swing. There were great sightings of a young white-tailed eagle and other birds of prey that perched on the tree line in front of us, when suddenly our attention was drawn to a silhouette on the far edge of the clearing. A beautiful large brown bear cautiously scouted the open area and looped his way around the marsh in front of us. Too far for photos, we sat silently appreciating his presence and the hide glowed with excitement as he slowly moved out of sight. The team returned to base camp for a hot shower and a hearty breakfast. The day was spent in informative photographic workshops and scouting locations in the surrounding areas looking at different photographic hides that have been in use for over fifteen years. Yet there is no rest for the adventurous. After a day of training and only a few hours of sleep, the team ate an early dinner, packed their gear once and headed back out to the hide. The marsh bathed in a golden late afternoon sunlight and our anticipation grew once more. The beauty of wildlife watching is that you never really know what to expect. Years of combined animal monitoring and experience gives a fairly good outlook on what might happen, but it’s all down to nature on the day. 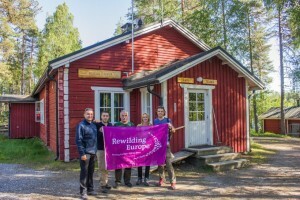 Rewilding Europe team at the Kuikka base camp, Khumo, Finland. A dark shape broke through the tree line thirty meters away. The beautiful male bear strolled into the open, the water audibly sloshing beneath his paws. A second bear followed him, smaller and possibly a female, a little more cautiously. They moved through the open area, splashing the water up into the gold rays of light with each step. It was a wonderful moment; a moment when you don’t know whether to take pictures, use binoculars, film or simply sit and take everything in. We were lucky enough to see three more bears that evening, and once darkness fell we all nestled in for the night until the dawn wake up call. The team felt truly privileged to have spent time with Lassi, a renowned professional in his field, in such a wild location. During the drive back to the airport, everyone discussed all the great ideas and innovations to be taken back to their respective Rewilding areas, adding to the progress already made for the up and coming seasons in 2016. New wildlife watching hides are being constructed and will be operational in the Velebit Mountains in 2016 and there will definitely be some important lessons incorporated from the trip to Finland. So keep your eyes open for the upcoming launch next year and don’t forget to take a look at the Rewilding Europe’s practical guide on wildlife watching hides.